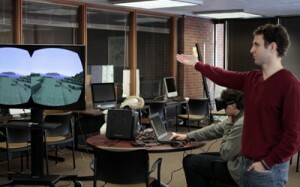 The UWM Digital Humanities Lab is located on the second floor of the Golda Meir Library’s East wing. Enter the Library through the West wing’s main entrance and take the stairs or elevator to the second floor. Cross the catwalk over to the East wing and the Lab is located to the left of the Music Library desk. The DH Lab also hosts an audio recording studio, specially equipped to provide a professional grade recording environment for voice recording. Please contact Ann Hanlon for more information about accessing and using the audio studio. One of the most attractive qualities of the Lab is its flexibility. It can accommodate several types of work comfortably. Small lectures to audiences up to 70 people are common in the Lab as are workshops for a dozen small groups. For individuals hoping to work in the Lab, an appointment must be made.